After weeks of following the reviews by the team at Fresh Milk Books, I finally got a chance to browse the Colleen Lewis Reading Room (CLRR) at the Milking Parlour Studio. Last week, Fresh Milk Founding Director, Annalee Davis, invited me to come and check out the reading room and meet the FMB team, so this Tuesday I dropped in. Only one member of the team was missing. When I got there artist and writer, Katherine Kennedy, was already there. Eventually artists Ronald Williams and Versia Harris filtered in. Sadly, Amanda Haynes wasn’t there, but with good reason. Anyway, everyone who was there seemed pretty busy, so I had time to browse and do some reading. However, like in any good library I was faced with the paradox of choice; the more there was to choose from, the harder it was choose. I moved from shelf to shelf picking up books and putting them back, until eventually I had to tell Annalee that I didn’t know what to choose. Fortunately, she was prepared for this and had selection of books that she apparently recommends indecisive people like me. 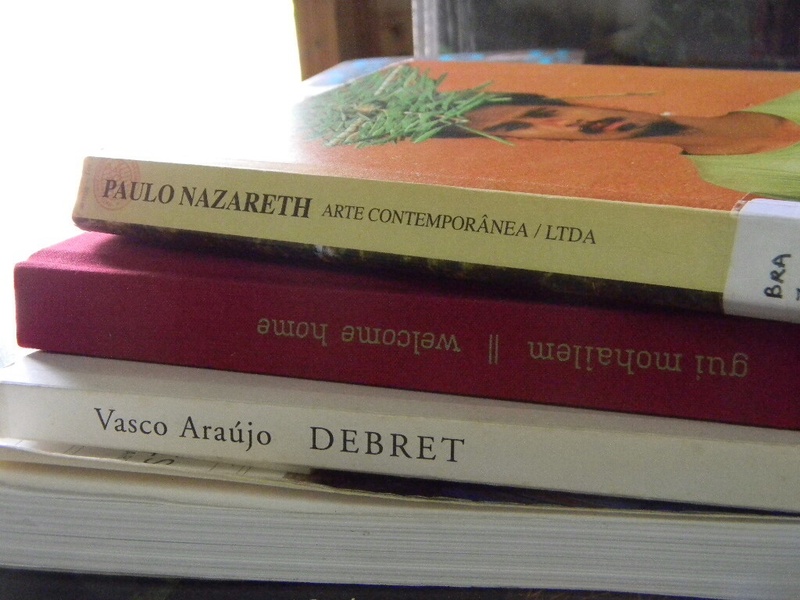 From her selection, the one I chose was Paulo Nazareth: Arte Contemporanea/LTDA. 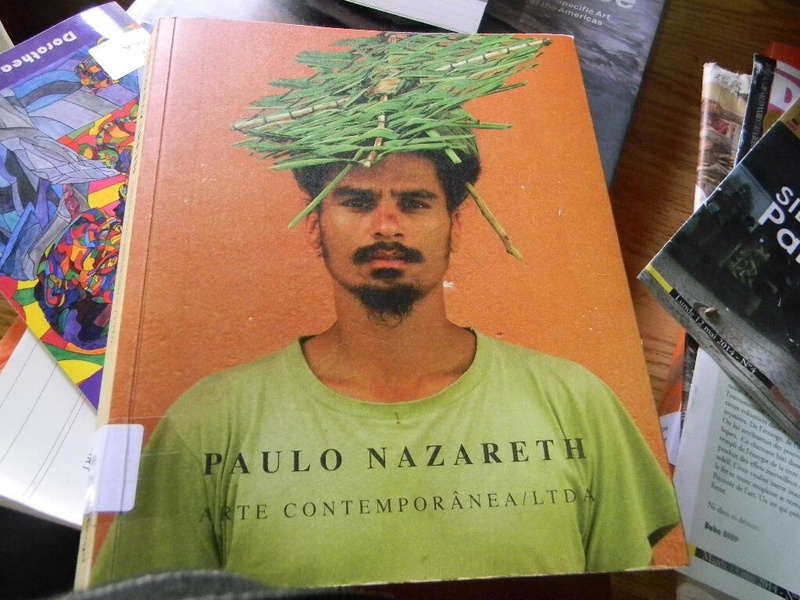 It follows artist Paulo Nazareth whose travels highlight the subjectivity of ethnicity and identity amongst other things. I almost finished reading it but I had to leave, so I’ll probably finish it next week. I felt a bit guilty about reading it when I could have been reading War and Peace for Classics Club Spin. My excuse is that I don’t think that I’m in the right mindset for long literary journeys, but don’t worry I’m not done with Tolstoy yet. I read to the tinkling of wind chimes, the rustling of leaves and to the roar and horns of the ubiquitous World Cup 2014 being streamed on someone’s laptop; it was Algeria versus Belgium. I read to the reverberation of footsteps on a paint splattered floor of what used to be Annalee’s studio. It was really great to just browse and read, it’s the first legitimate library experience I’ve had in a long time and I’m looking forward to finishing the book next week. I’m also looking forward to attending the Barbados book launch next Thursday of something called See Me Here: A Survey of Contemporary Self-Portraits of the Caribbean at the last Fresh Milk event before the summer break, Fresh Milk XVI. All in all, there are some interesting things to look forward to, and I think I have a new Tuesday spot. 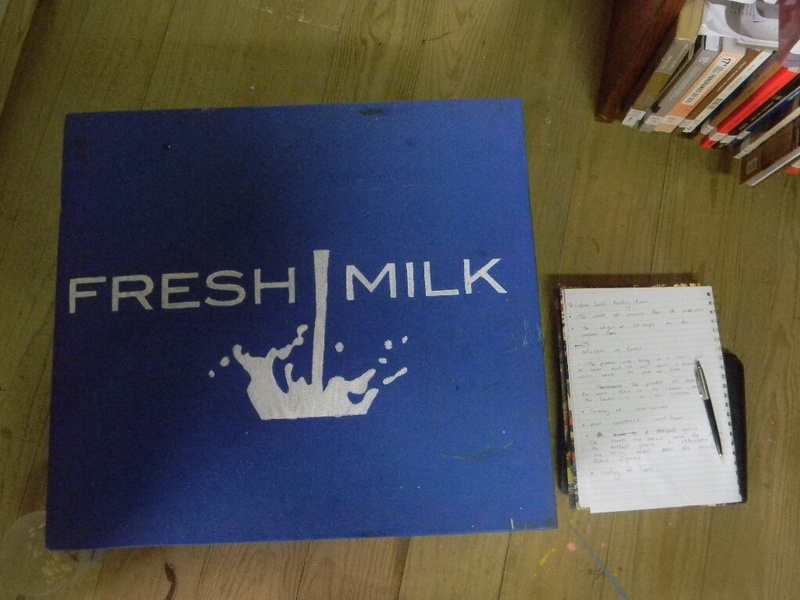 This entry was posted in Non-Fiction, Thoughts and tagged Books, Caribbean Art, Fresh Milk, Fresh Milk Books, literature, Paulo Nazareth, See Me Here: A Survey of Contemporary Self-Portraits in the Caribbean, The Colleen Lewis Reading Room. Bookmark the permalink. The Sunday Salon: Book or E-book?